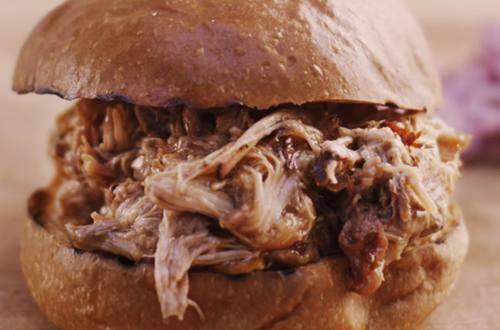 Keep it slowwwww and smoked with this pulled pork recipe. While in London, aka The Big Smoke, more and more people were smoking their meat. Try it. It will change your world. 2 Massage the rub or paste into the pork shoulder. 3 Slow cook for 4-5 hours until a mahogany colour. 4 Wrap the cooked meat in paper lined foil with cider vinegar, apple juice, Worcestershire sauce and pineapple juice mix and cook at 110 ºC for at least another 4-6 hours until 90 ºC internal. The meat should start feeling soft to the touch and that’s how you know it’s going to pull..
5 Pull the meat off the bone and mix with Hellmann's American BBQ sauce.